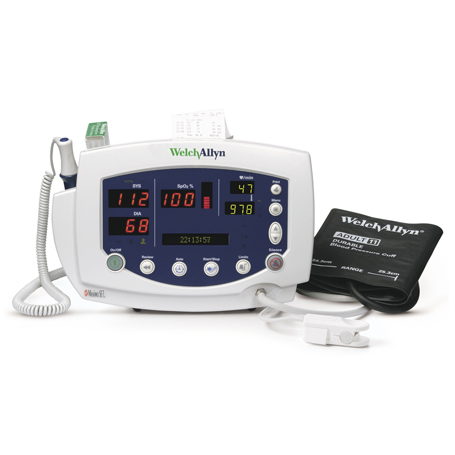 Welch Allyn DuraShock Cuff is a Velcro Adult Cuff blood pressure gauge with innovative DuraShock technology – the first and only gear-free, shock-resistant aneroid sphygmomanometer technology. For use by Individuals trained in auscultatory blood pressure technique to determine systolic and diastolic blood pressure in humans and animals. Gear-free DuraShock design is much more durable than traditional aneroids with gears. This integrated system features a Flexi-Port cuff mounted design that is compact and lightweight for ease of use. Blood pressure measurements determined with this device are equivalent to those obtained by a trained observer using the auscultatory method, within the limits prescribed by the American National Standard ANSI/AAMI SP9, 1994, non-automated sphygmomanometers.